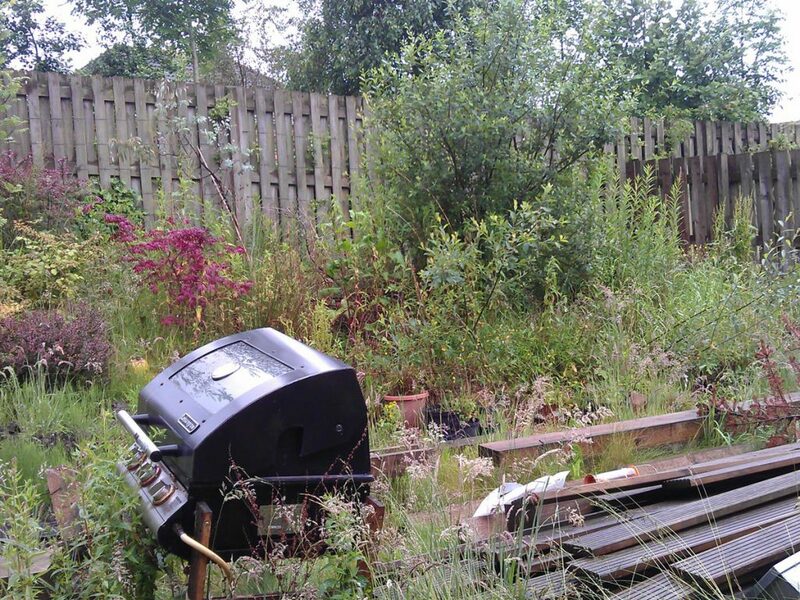 Our clients were faced with an overgrown outdoor space which “featured” various left over materials. 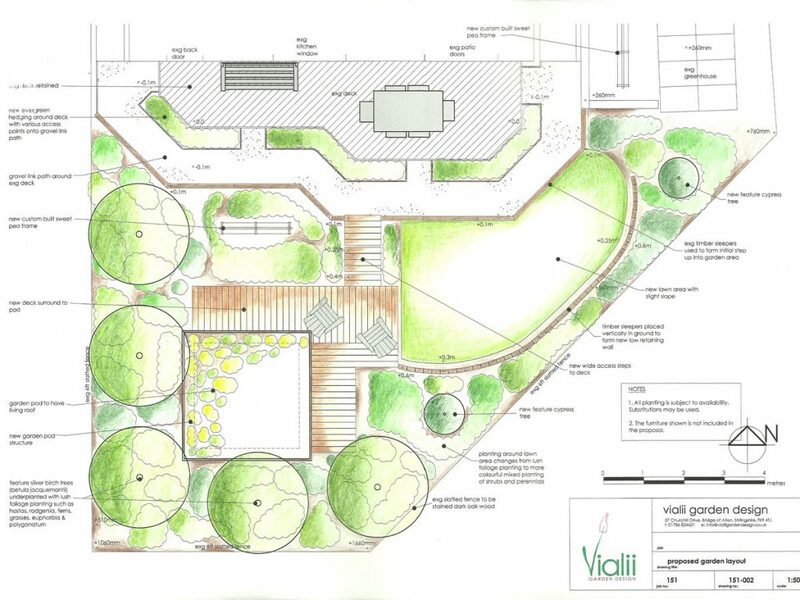 They were looking for a more manageable garden and wanted to create a space for sitting outside, despite the weather. As the garden was sloping there was an issue of levels which needed to be addressed. 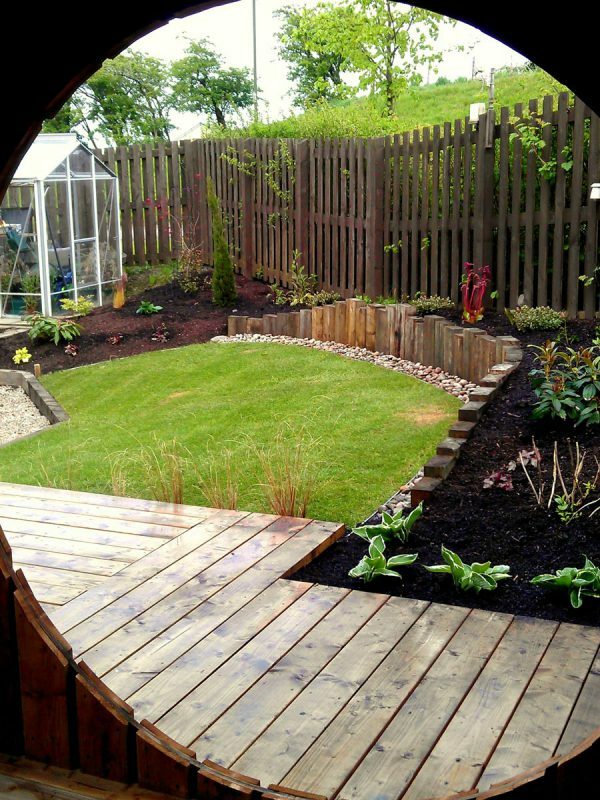 By using vertical sleepers, we created a feature retaining wall which gave a gentle curve and with the varying heights of timber added extra interest as well as somewhere to perch whilst weeding. 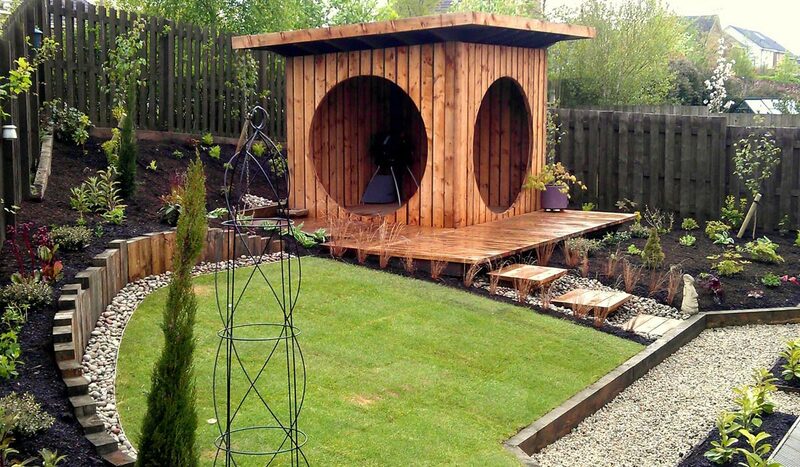 The main feature of the garden is the “pod”, a contemporary outdoor room, providing a stylish place to enjoy the garden, whatever the Scottish weather. "I'd forgotten how bad it was before, but so chuffed I found Vialii. Fantastic people to deal with and just could not be happier with the result! I've spent my evening either wandering around or staring at it from the window!" The large circular doorways are a key feature of the “pod” and provide great views across the garden whilst still providing shelter from the prevailing wind. 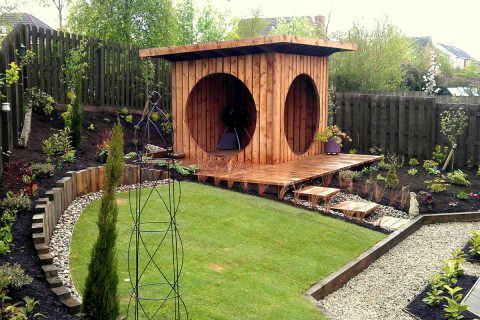 The “pod” sits on a decked platform made from chunky timbers and provides space for a small bistro set for sitting out. 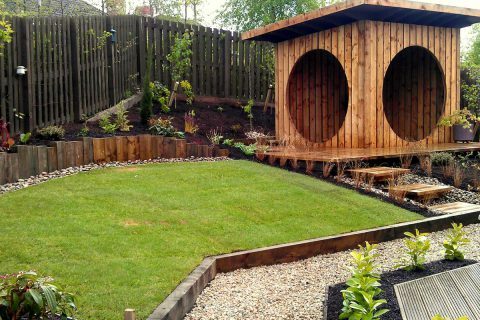 Additional features include a chain providing a contemporary rain overflow to the pod and the living roof is an attractive finish as well as great for wildlife. 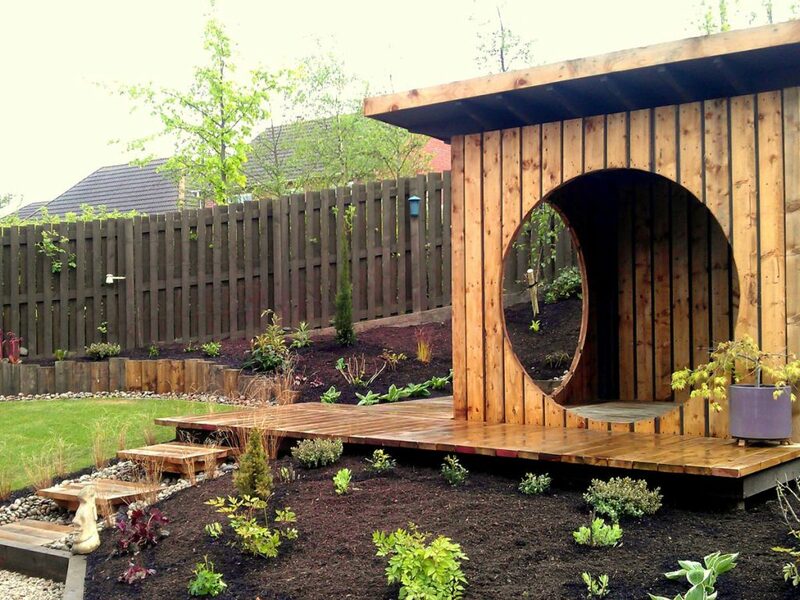 This pod was hand built by Vialii to suit the client’s budget, with inspiration from Martin Howard Furniture – for more information on garden pods visit their website. “Floating” steps provide access to the new deck and pod and large Scottish pebbles are used around the garden, giving a modern finish. 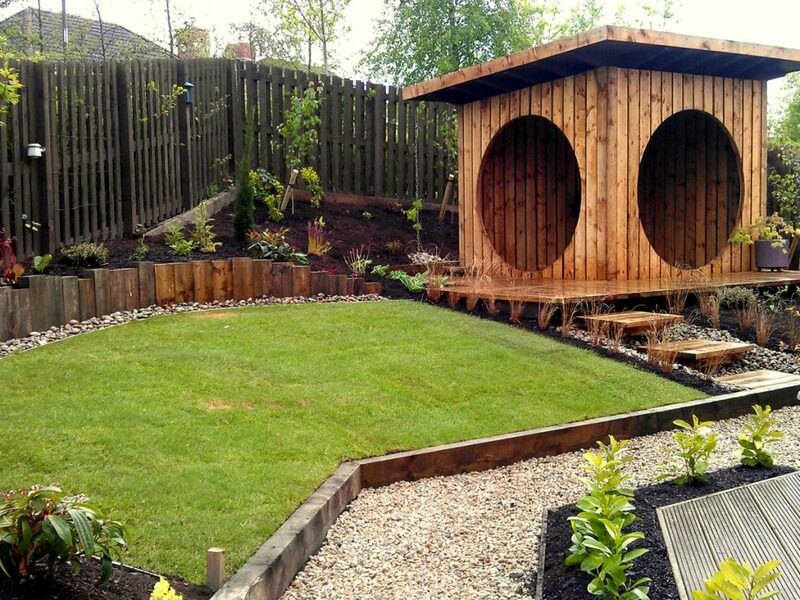 A new lawn was laid providing a beautiful contrast to the timber in the garden. The borders were planted with lush green planting such as hebe, hosta, astrantia and hydrangea providing year round interest and texture. 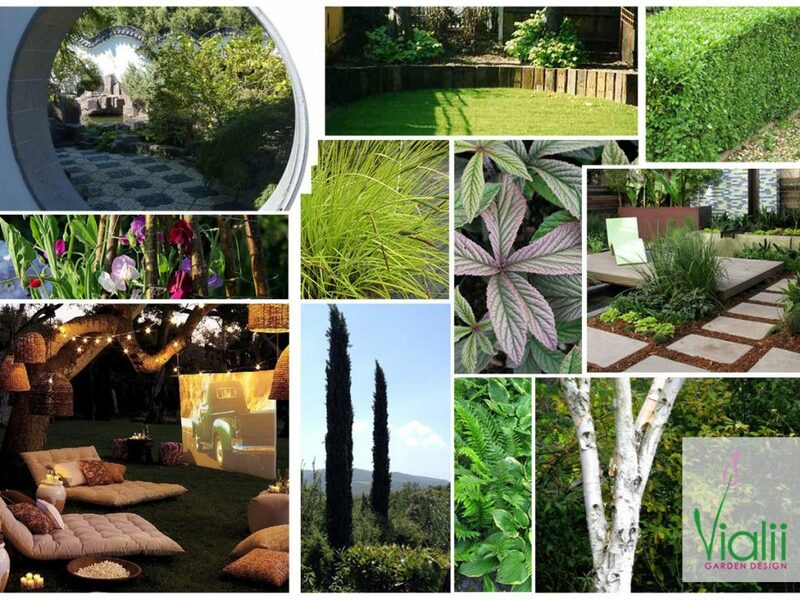 A woodland area was created with rodgersia, euphorbia, ferns and polygonatum. Height is added through cypress trees and silver birches. A living roof completes the “pod” and attracts wildlife.